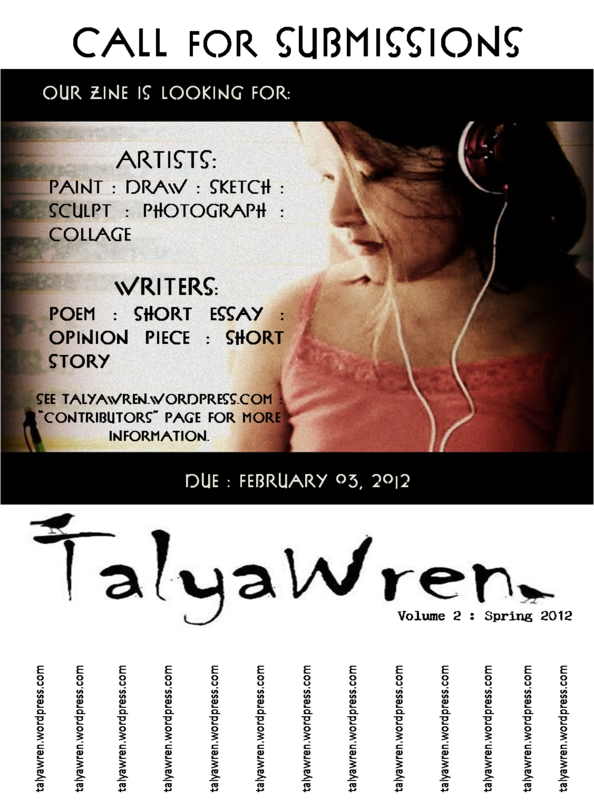 TalyaWren (a zine project) is taking submissions for its Spring 2012 edition. This year’s zine will focus on the Performing Arts: Vocal, Instrumental, Dance, & Drama. And we’ve given ourselves this opportunity to help raise funds for Door To Grace (doortograce.org). 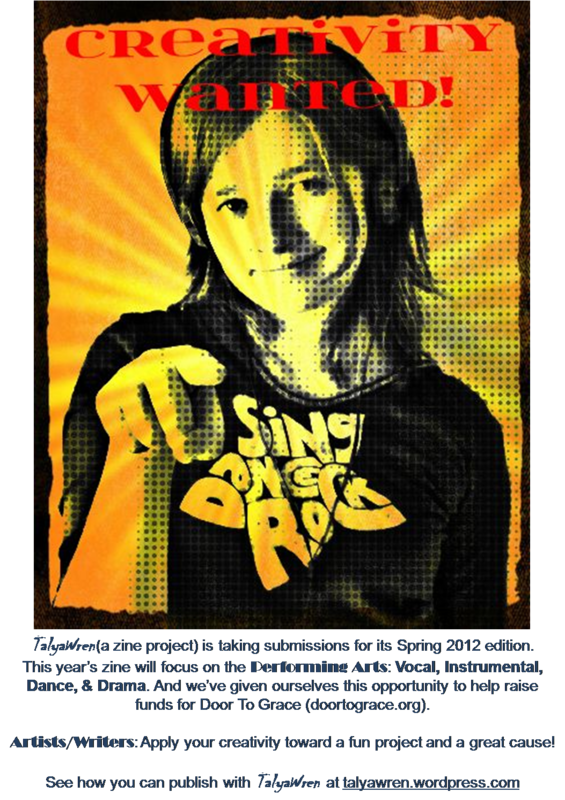 Artists/Writers: Apply your creativity toward a fun project and a great cause! we snapped the photo this afternoon, N just happened to be wearing that shirt today (and she is hardly without her headphones these days). we uploaded the photo to befunky.com for manipulation. added text. voila! 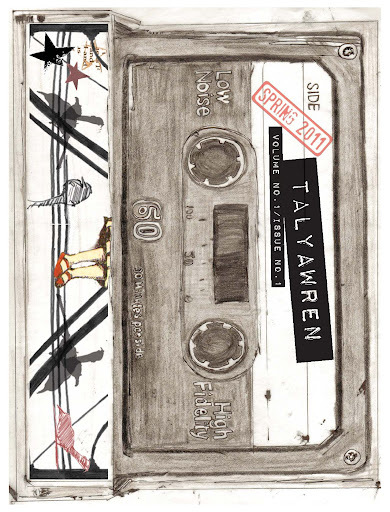 TalyaWren will be back for a second edition : Spring 2012! and we are looking for collaborators! This year’s zine project focuses in on four areas of Performing Arts : Vocal, Instrumental, Dance, and Drama. Can you tell this zine is Natalya’s project? If you can draw, paint, photograph, cut & paste, etc., we are looking for art submissions tackling each individual section. We are looking for theme-oriented poems, short essays/opinion pieces, or short stories. And if you like to have opinions and want to make sure you don’t miss out on polls or surveys, do read the “How to be a part of TalyaWren : Spring 2012”, too. This may be a fun art project to participate in–and it most certainly is!–but might we also create an opportunity to contribute to something greater? Last year friends and family submitted work to the zine as way of helping Natalya make a special ‘thank you’ gift for those whose monetary contribution got her to Germany for an Exchange Program. This year we decided to try raising funds once more. Spring 2012 will be another ‘thank you’ card for those who would like to help us give a modest monetary donation to Door To Grace, a Portland, Oregon based movement whose mission is “to restore life to rescued children” (doortograce.org). TalyaWren has proven a bit of a challenge, certainly an education, but most of all a lot of fun. We want to include you. Check out the details on how to you and yours can become involved. How to become a part of TalyaWren : Spring 2012.
! !–We are looking for something visually illustrative/related to one of these four subjects: Vocals, Instruments, Dance, Drama/Theater. –Artwork need not be submitted in b/w, but do consider how it might translate. –Size is another consideration, but please do not find this daunting.
! !–We are looking for poems, short-essays/opinion pieces, and short stories inspired by or directly related to one of these four subjects: Vocals, Instruments, Dance, Drama/Theater. –For the sake of legible font-size, essays and stories need to mind 300 words or less; or 600 words or less. We will work with word count and space if the submission is that good. We will help with the editing process if that is a concern. –essays/opinion pieces can vary in theme under each of the 4 umbrellas. We will be featuring a longer piece on why Musical Education is important to keep in our Schools. 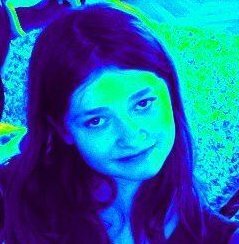 Feel to speak to this or anything else. –Ideas: How does (or has) your experience as a Singer, Instrumentalist, Dancer, Actor, Stage Crewman, Producer, Song Writer, Costume or Set Designer, etc. affect(ed) you positively (or negatively)? Do you have a funny story? Do you have a hero you would like to call to our attention? Is there an injustice or something beautiful you would like to write eloquently about? Do you have a fantastic experience of a show or growing up w/ a performer to share? –We will be hosting “Questions to Think About” on our blog and we will be doing surveys. Perhaps one of those prompts will inspire a nice bit of writing. –If you are interested in interviewing your music teacher: email us, we have questions we concocted for Natalya’s Choir and Orchestra instructors. Let’s talk!
! !–If you would like to be included in any survey or poll, make sure we have your e-mail with the notice: please be sure to include me in any survey or poll. -Our audience is aged 10 & up. -You are not limited to one submission. -Please include your name, age, location, and the title of your piece and a date with each submission. -We are hoping to receive enough interest that we will have to make Natalya and company choose what goes into print. If, for whatever reason, the submission cannot fit or is not chosen, we will likely ask to feature it on the blog with the release of the zine. You will be asked permission. -We will send a zine to each contributor of a work of art or written piece that is printed in the zine. We hope to be able to afford to do this regardless of the number of contributors per household. We also want to gift a zine if an artistic contribution is accompanied by a monetary one. We hope that the smaller size and b/w printing will make this feasible. 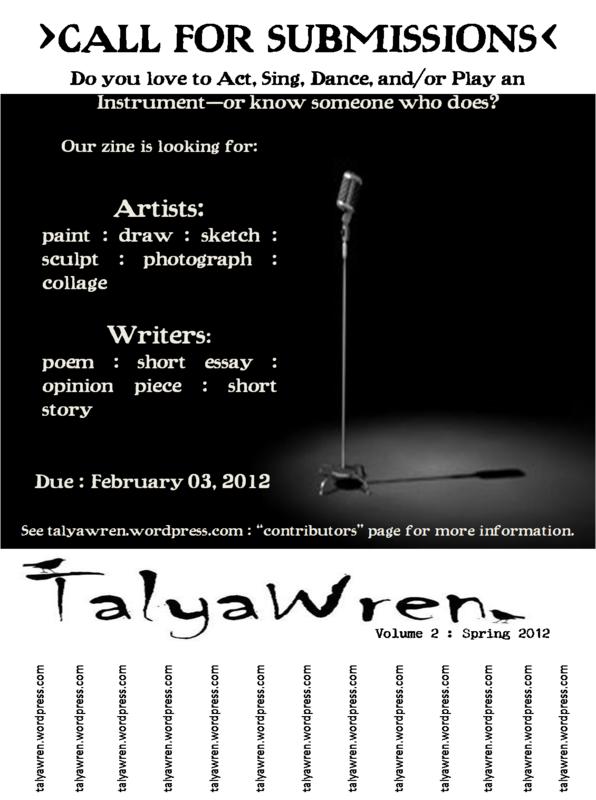 -You can submit pieces by mail or you can email them to talyawrenzine[at]stonhaus[dot]com. Please email for questions, concerns, and a mailing address if needed. -Remember the Submission’s Due Date: February 03, 2012! We will send out reminders.